This exhibition was set up in the upstairs gallery of the Astley Farmhouse in November 2017 and will remain in place until the end of February 2018. 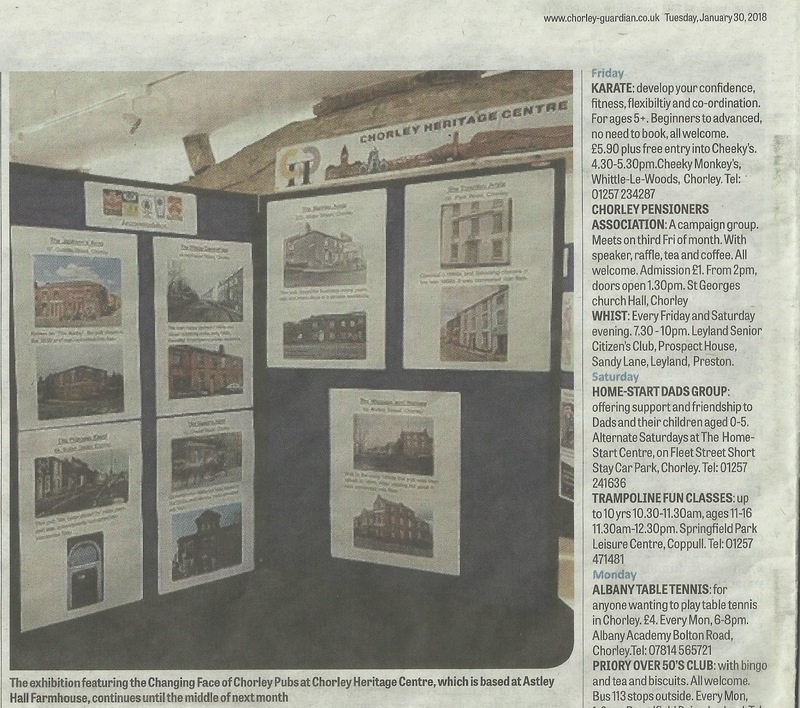 It celebrates the town’s rich history of public houses and reflects upon their rise and fall and the new uses to which those buildings are now being put. First a bit of historical perspective. Whilst the industrial revolution led to significant expansion in the town from the 1760s onwards in 1793 there were still only fifteen pubs in Chorley and it was legislation that really shaped the landscape to come. 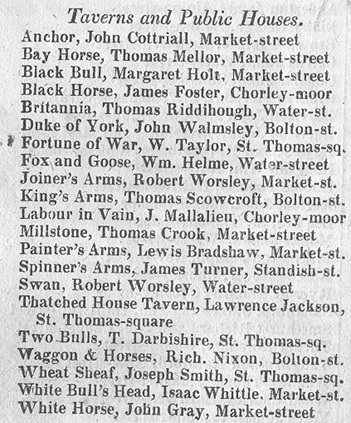 A few of Chorley’s earliest pubs still trade today, including the Black Horse, Duke of York, Joiner’s Arms (Last Orders), Thatched House Tavern (Rose & Crown), Wheatsheaf (George), and the White Bull’s Head as shown on the 1818 directory listed below. Three key pieces of legislation have had an enormous impact on the trade and their effects are clear to see by the numbers of pubs before and after these were enacted. A revolution for pubs was brought about by the Beerhouse Act of 1830, which liberalised the regulations enabling anyone to brew and sell beer on payment of a licence costing two guineas. The intention was to increase competition between brewers, and it resulted in the opening of 56,000 beer houses across the country by 1836; the rapidly expanding industrial centres of the North of England saw their fair share and in Chorley 25 new Beerhouses had opened by 1834! It was also hoped that by increasing competition in the brewing and sale of beer, and thus lowering its price, the population might be weaned off their favourite tipple, gin…current trends seem to indicate we are going full circle! Another by-product was the “tied-house” system, as landlords had to borrow money from the brewers to make improvements before Magistrates would grant and renew licences. In exchange they promised to buy supplies exclusively from the breweries. 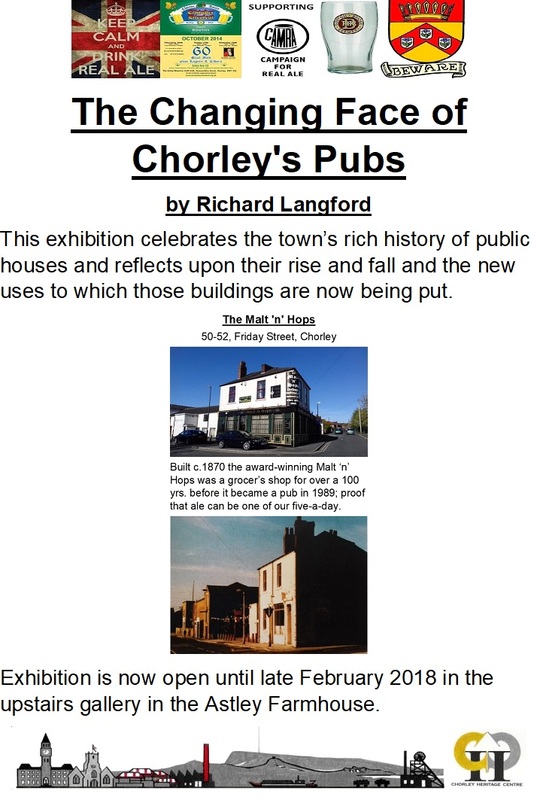 By contrast, the 1904 Licensing Act was to have a markedly different effect on the pub scene in Chorley, reducing the number of licensed premises, in particular the beer houses over the next few decades. Supported by a surge in the Temperance movement the Act introduced a national scheme where Licensing Magistrates could refuse to renew a pub’s licence if it was considered there were too many pubs in an area or they were not of sufficient quality. Compensation was paid both to the owner of the premises and the licensee, although typically only about 10% went to the licensee! In the first two decades of the 20th century hundreds of pubs were to close in Lancashire as a result of the new act. Since WW2 we have seen a worrying trend of pub closures across the UK reflecting post-war Britain and a general change in lifestyle e.g. 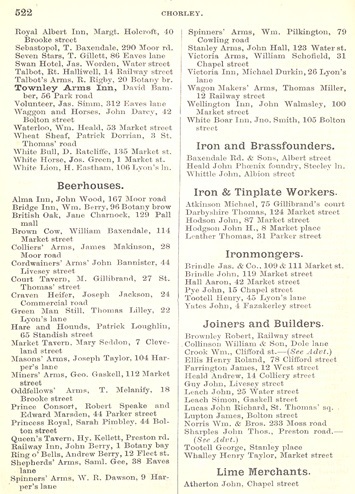 of the 28 Beerhouses listed in 1882 only 6 are still in business today. Whilst this has had a significant impact on Chorley we should also celebrate a recent increase in micropubs and bars opening in and around our town centre. Micropubs are still a relatively new phenomenon, the first in the country only opening in 2005 after the introduction of the Licensing Act 2003. This effectively removed competition as grounds for objection of new licenses; the licensing authorities were now only asked to consider objections relating to crime and disorder, public safety and the protection of children. It still wasn’t until 2014 that Chorley’s first micropub, the Shepherds’ Hall Ale House opened but since then a further seven have popped up around the town centre, with more opening in the outlying villages. A series of annotated maps displayed in the exhibition show where our pubs were located, some dating back to the 1700’s. A few of the older pubs are still in business today, some under different guises whilst others have found new uses or have simply been demolished and are long since forgotten. Pictures of the buildings help visualise what the town was like in decades past for those of us not originally from Chorley or too young to remember.